단양읍에서 동쪽으로 16㎞ 떨어진 산골짜기의 밭 한가운데에 서 있는 탑이다. 주변에 자기조각들과 기와가 널려 있어서 이 곳이 절터였음을 알려주고 있으나, 절의 흔적은 찾을 수 없다. 1935년경 탑 속의 사리를 도둑맞으면서 허물어졌던 탑을 마을 주민들이 다시 세웠다고 한다. 이 탑은 2단의 기단(基壇) 위에 3층의 탑신(塔身)을 세운 형태이다. 기단은 여러 장의 길고 큰 돌로 바닥돌을 놓고 그 위에 쌓은 모습이며, 각 모서리와 각 면의 가운데에 기둥 모양의 조각을 두었다. 탑신부는 몸돌과 지붕돌이 각각 한 개의 돌로 되어 있다. 몸돌에도 모서리 마다 기둥 모양의 조각을 두었으며, 특히 1층 몸돌에만 문짝 모양의 조각이 있어 눈길을 끈다. 지붕돌은 밑면의 받침수가 층마다 4단이고, 지붕돌 위에는 2단의 괴임돌을 두었다. 추녀 밑은 반듯하고, 지붕돌 윗면의 경사 역시 온화하여 네 귀퉁이의 선이 뚜렷하게 드러난다. 꼭대기의 머리장식으로는 노반(露盤:머리장식받침)과 복발(覆鉢:엎어놓은 그릇모양의 장식), 앙화(仰花:솟은 연꽃모양의 장식), 보주(寶珠:연꽃봉오리모양의 장식)가 남아있다. 석탑의 형태가 우수하고 비례도 충실하며, 조각수법에서도 통일신라시대 석탑의 양식을 충실하게 따르고 있다. 단정한 탑의 조형을 보여주는 아름다운 작품으로, 통일신라 후기에 세워진 것으로 보인다. 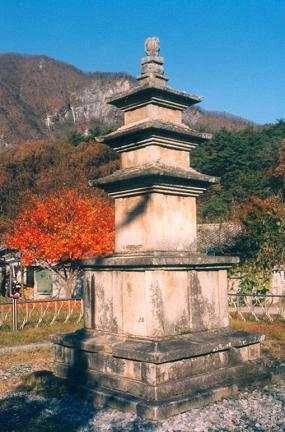 This pagoda is located in deep mountains 16 km east of Danyang-eup. Only a few roof tiles and pieces of pottery around it indicate that this used to be the site of a temple. 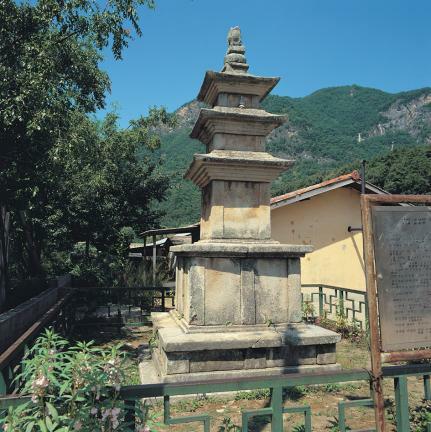 The pagoda was broken down in 1935 when the sarira in it were stolen but it was rebuilt by the residents of the local village. 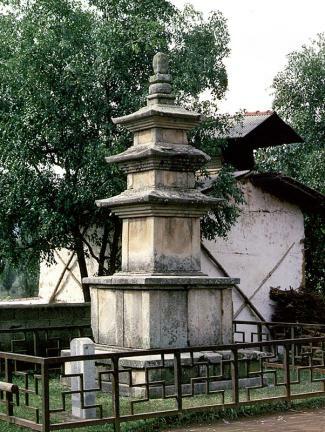 The pagoda has the structure of a three-story body on a two-story stylobate. 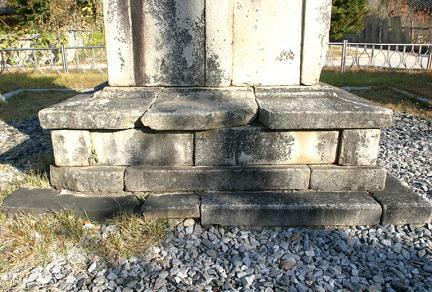 On the hardened earth, several big and long stones are laid as a foundation, and the lower and the upper stories of stylobate are placed on it. The corners and middles of each story of the stylobate are decorated with carvings of pillars. The main stone and the roof stone of the body are each made of one stone. 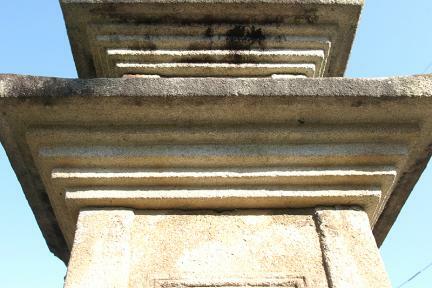 Each main stone is engraved with pillar patterns in the edges. 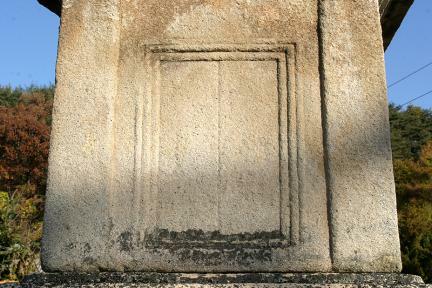 On the first story of the main stones is a carving of a pair of doors. 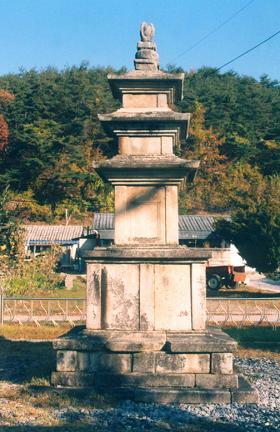 Each roof stone has a 4-tiered base underneath, and a 2-tiered support rests on the roof stone. The bottom line of the eaves is horizontal, and the slant of the roof is gentle but clear at the corners. The decorations remaining on the finial are the final base, over-turned bowl, a lotus flower pattern ornament and a lotus flower bud ornament. With its neat finishing touches and exquisite carved decorations, the pagoda typifies the beauty of the pagodas built in the late Unified Silla period.